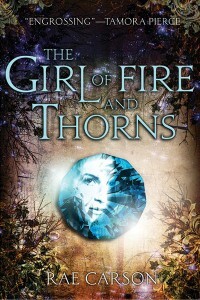 The Girl of Fire and Thorns by Rae Carson is blurbed by the amazing Megan Whalen Turner: “Rae Carson’s heroine is a perfect blend of the ordinary and the extraordinary. I loved her.” — Megan Whalen Turner, author of Newbery Honor book, THE THIEF. So of course, I’m interested. It has also gotten positive reviews around the blogosphere and another favorite author of mine, Sherwood Smith, thoroughly enjoyed reading it. I’m always up for fantasy reads with strong female protagonists and this one looks like something that I’d be really into. It was available on NetGalley before it was released but unfortunately, I wasn’t able to grab a copy. Once every century, one person is chosen for greatness. But the prophecy is vague, and Elisa, always overshadowed by her accomplished older sister, has no idea why she was chosen or how she will fulfill the expectations. Her future is unknown and her potential is tremendous — even if she doesn’t realize it. A king asks her to save his troubled country. A savage enemy hunts her for its own — dead or alive. A revolutionary asks for her heart. And in the midst of ferocious battles and harsh quests, Elisa will find herself. She will find the strength she’s always possessed. She’ll find deep and abiding love. She’ll awaken the power that only she can control. And she’ll face those who want to rip all of it away. What about the rest of you, what book is in your wishlist? I hope you get a chance to read this soon, it really was awesome! I hope it turns up in local bookstores! I want this book, too. It sounds really good and I’ve seen only positive reviews for it. I didn’t know Megan Whalen Turner blurbed it. Want more now!! Glad I’m not the only one who wants this book because of MWT’s recommendation! It really looks like something I’d enjoy reading. I’ve been wanting this book too! Even more since it’s gotten some mixed reviews…I’m curious to see whether I like it or not. Sandy, you’ve seen mixed reviews for this? The reviews that I’ve seen from the bloggers I follow and Goodreads friends have been positive. Really? Okay, I’ll keep that in mind when I read this so my expectations won’t be that high. I feel really bad that I missed it on NetGalley. Yup, another one I want too. I like the premise, and the cover! I’m not a fan of the cover but I’ve heard it’s better than the whitewashed ARC cover. Sounds interesting, Chachic! May MWT seal of approval pa! She rarely blurbs books so it means she really liked this one! This book is really, really good! I was lucky enough to meet Rae Carson on Sunday at Books of Wonder alongside Tamora Pierce, who blurbed her book (which is what ultimately had me pick it up to read the day I did over two other titles). I hope you get to read it soon!! Wow, you met Rae Carson AND Tamora Pierce in person? Lucky! Thanks for the feedback about the book, really want to read it but haven’t seen copies in local bookstores. Megan Whalen Turner’s praise certainly got me interested! I know, right? Makes us MWT fans more excited to read it! I do want this book! I have seen it on Goodreads and the cover is very intriguing! I also love the premise of this novel. Here’s my Want Books post! It looks promising, right? But I heard that some people didn’t like this so I really have no clue what I’ll think of it. I read this book way before it came out!!!! like in 2010! Becuz my teacher went to this confrence and met all kinds of authors, and they gave her free books! So i borrowed this one and stated reading! IT was sooo goood! I couldn’t put it down! And i really wished that place was real. I mean, I’m not a freak or anything but it sounds so… magical! Lolz Hope you all get to read it! It’s great. Can’t wait for the second and third one! God i wish it was 2012 now!!!! Oooh maybe your teacher went to Book Expo America or a similar conference? It’s a good thing you got to read it early because it looks like you’re really enthusiastic about it. 😛 I still haven’t read it but I’m really curious!